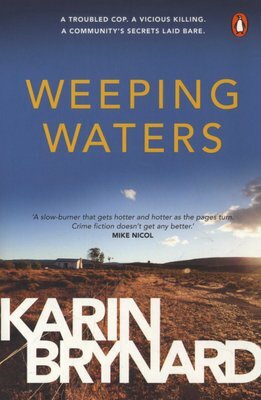 Inspector Albertus Beeslaar has left the ruthless city, only to have his hopes of finding peace and quiet in the Kalahari shattered by the brutal murder of artist Freddie Swarts and her adopted daughter. But Freddie's journalist sister Sara is not convinced that this was a typical farm attack. Amid a spate of stock thefts, Beeslaar must solve this high-profile crime, all the while training his two rookie partners, Ghaap and Pyl. After more murders, the disturbing puzzle grows increasingly sinister, as age-old secrets and hostilities surface, spurring the local inhabitants to violent action. 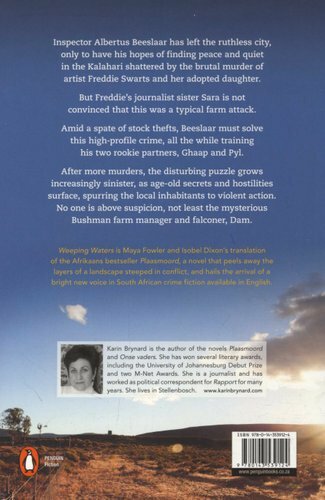 No one is above suspicion, not least the mysterious Bushman farm manager and falconer, Dam. Weeping Waters is Maya Fowler and Isobel Dixon's translation of the Afrikaans bestseller Plaasmoord, a novel that peels away the layers of a landscape steeped in conflict, and hails the arrival of a bright new voice in South African crime fiction available in English.